Posted on January 1, 2007, 9:21 pm, by Andy, under Miniatures, Science Fiction, Wargames. Happy New Year! Now that the holiday craziness is over, it’s back to Real Life (and, hopefully, regular posting). 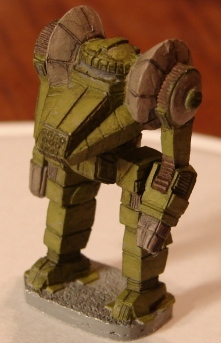 It’s the first Battletech mini I’ve painted in well over a decade, and I’m sure it shows. Nevertheless, I’m pleased with how it turned out. The mech is a Kurita Dragon, an unremarkable but solid workhorse, chosen for my first paint attempt because it was simple to assemble. The color scheme is for deployment in a forest-type environment. As you may note, I used a very diluted black wash to give it a battle-worn appearance–what’s supposed to look like carbon scoring, smokestains, and rust marks. That effect didn’t turn out quite as I had hoped (remember, it’s my first time! 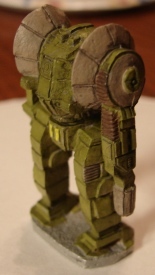 ), but I learned a few lessons for use on the next mech (an Exterminator, already primed and ready to be painted). All in all, a fitting way to greet the new year. I hope 2007 is already shaping up to be a good year for you, and I hope that your list of New Year’s resolutions includes at least one pledge to do more gaming this year!